Police inspect the vehicle driven by Gonzalez, who was shot dead on Tuesday. 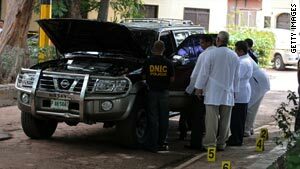 (CNN) -- Unidentified gunmen killed Honduras' top anti-drug cop on Tuesday, a national police spokesman told CNN. Gen. Julian Gonzalez, director of the Office for Combatting Drug Trafficking, was gunned down in his sport utility vehicle by two people on a motorcycle, said police spokesman Orlin Cerrato. "The motorcycle approached and fired indiscriminately into the driver's side door," he said. No arrests had been made as of Tuesday evening, and the investigation remained active, Cerrato said. Gonzalez was struck by six to nine bullets and died at the scene, Cerrato said. The top anti-drug cop usually travels with bodyguards, but he was by himself when he went to drop his daughter off at her school in the northern part of the capital, Tegucigalpa, Cerrato said. Investigators suspect that Gonzalez was being followed by his killers because the attack happened after she was dropped off, as soon as he stopped in traffic, he said. As U.S. and Mexican authorities have stepped up counternarcotics efforts in North America, Central America has become an important drug transportation point. Gonzalez had been threatened in the past, Cerrato said, but it remained unknown whether the threats were related to the killing. "You have to keep in mind that the post he held carried a certain amount of risk," he said. Honduras is in a controversial transition period between a de facto government that came to power after a coup and a recently elected successor. Tuesday's attack was believed to be unrelated to the country's political crisis, Cerrato said. Colleagues at the Office for Combatting Drug Trafficking declined to give details of Gonzalez's tenure and work because they were not authorized to speak with the media. "Sadly, he died at the hands of organized criminals," said one detective. "That's the only comment I can make." The brazen killing of a top official is "another sign of the concern that drug gangs are expanding their presence," said Maureen Meyer, of the Washington-based Office on Latin America, a nonprofit agency that promotes human rights and democracy. Honduras is a country with weak institutions, which make it easy for gangs to operate, she said. "I think what we've seen in the past few years is that you have an increasing use of Central America as a transit area" for drugs, Meyer said. Conflicts exist between local gangs and increasingly with Mexican drug cartels that are muscling in, she added. Some observers say that the country's six-month-long political crisis over presidential leadership has created an atmosphere where organized crime could prosper. In March, Gonzalez announced a large bust of more than three tons of cocaine intercepted aboard a boat sailing from Venezuela to Honduras. The Honduran and U.S. navies worked together to seize the drugs from the vessel, which was trying to blend in with fishing boats to sneak toward the coast, according to media reports at the time.